A big hau`oli lā hānau (happy birthday) to Hawaii’s own Bruno Mars multi-talented singer, songwriter, musician and producer who has already been performing for over 25 years. 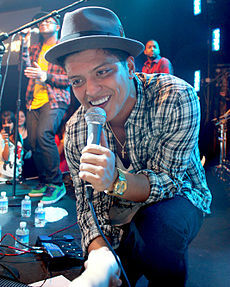 Born into a musical family on October 8, 1985 and raised in Waikiki, Bruno took the stage at only 3 years old. The pint sized performer made a big hit with audiences 5 days a week as a mini hip gyrating Elvis Presley with his family’s band, The Love Notes. Bruno’s musical star continues to rise higher and the reason is obvious. Bruno’s hō`ailona hānau (Hawaiian lunar birth sign) reveals that he has everything going for him on his path of destiny. According to Hawaiian tradition, those born during the month of ‘Ikuwā (October) possessed loud voices, made excellent heralds, persuasive spokespersons, influential chiefs and is spiritually identified with the Hawaiian deity, Kū (upright), the male generating power and the element of ea (air). ‘O ‘ikuwā i pohā kō‘ele‘ele, ‘ikuwā ke kai, ‘ikuwā ka hekili, ‘ikuwā ka manu. (‘Ikuwā is the month when storms arise, the sea roars, thunder reverberates and the birds make a din in the forests.) Bruno is making his mark on the musical world with a loud noise – all melody and harmony! People born in ‘Ikuwā are gifted and always strive to achieve happiness and harmony in their life. What Does Your Hawaiian Lunar Birth Sign Say About YOU?